Welcome to our website, and to the parish of Kenn, consisting of the villages of Kenn and Kennford, and hamlets of Clapham and Splatford. The parish is split by the major road junction of the A38 and A380, known as the Splatford Split, giving easy access to both the sea and Dartmoor. The forest park at Haldon and Exeter Racecourse are within our parish helping to bring visitors down to this beautiful part of Devon. BE A LOCAL COUNCILLOR - MAKE A DIFFERENCE TO YOUR PARISH - YOU ARE NEEDED. Not enough people stood for Kenn Parish Council - the law says we need to have another election. Dates will be advised as soon as known. KENN NEEDS SEVEN MORE PEOPLE FROM WITHIN THE PARISH TO STAND FOR COUNCIL. 7.5 ton + weight restriction limit for Kennford and Kenn. Council are trying to get a weight restriction limit in place for our villages and would appreciate your help. We need to supply evidence of the large lorries that are continually coming through on our village roads. Evidence in this instance means photographs. Can you help? 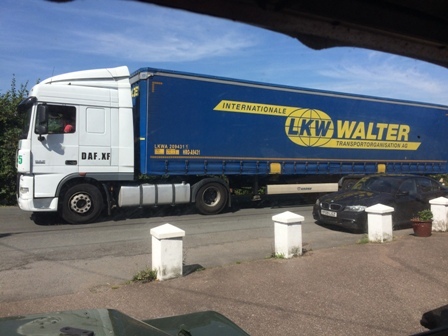 Any photos of lorries getting stuck, mounting the pavement/grassed areas, or simply using the village as a shortcut would be appreciated, plus the date/time when taken. <<<<<<<Stuck in Kennford on 28th August 2017. The Parish Council is working with Teignbridge District Council to explore options for using the land at St. Andrews Close for 2 or possibly 3 affordable homes/bungalows for local people. It is very early days and we are aware that there is a need for some smaller homes for people already living in the Parish needing to downsize. As we progress the project we will keep the community informed about the plans. We are looking at the different options for what could reasonably be developed and how the community could be involved. Teignbridge DC has received some money from government for community led housing and the Parish Council will be ‘bidding’ for some of that money to pay for the technical work needed such as a survey of the site and working up the plans. The Council have employed a contractor to cut the grass around the parish on a monthly basis. This does not include visibility splays which are the responsibility of Highways.